/By Hal Ginsberg/ Following its editorial last week in support of businessman David Blair for Montgomery County Executive in the June 26 Democratic primary, the Washington Post yesterday issued endorsements for the nine Montgomery County Council seats. None of the Post’s picks is a consensus darling of the mostly progressive organizations that have weighed in so far. 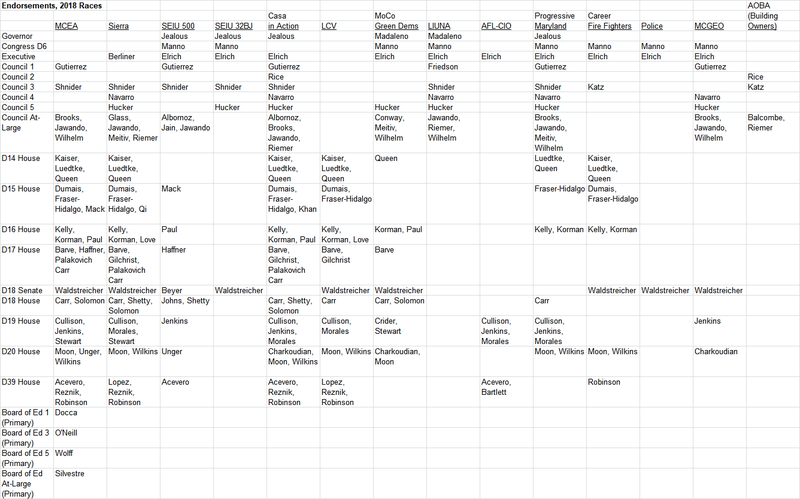 As of April 10, according to the political blog Seventh State’s helpful but dated and non-exhaustive spreadsheet, progressive councilmember Marc Elrich has earned ten endorsements while Council President Roger Berliner has one. The other four candidates, including Blair, have no identified institutional support and even Blair’s website does not trumpet any. In the primary race for the four Council-at-Large seats, Seventh State identifies the four candidates with the most endorsements as Will Jawando with seven, Chris Wilhelm with five, then Brandy Brooks and incumbent Hans Riemer with four each. [Full disclosure: the author is a paid canvasser for Chris Wilhelm.] Of these candidates, the Post supports only Riemer - adding Gabe Albornoz, Marilyn Balcombe, and Evan Glass to the mix. That the Post’s endorsements do not track those of the various left-leaning groups and unions that have weighed in is no surprise. Despite its reputation as a liberal newspaper, dating back to Watergate, for decades the Washington Post’s opinion pages have been on balance somewhat progressive on social issues, neoliberal on economics, and neoconservative on foreign policy. Exemplifying this consistency, Fred Hiatt has enjoyed an uninterrupted run as editorial and opinions pages editor since 2000. Thus, the Post’s current slate of Montgomery County candidates may reflect nothing more than the paper’s traditional preference for management over labor and the “wise use” of public and private lands rather than sustainability. But there is a more sinister explanation. The richest man in the world Jeff Bezos bought the Washington Post in 2013. Over the past year, Bezos’s primary enterprise Amazon has been engaged in a high-profile search for its second corporate headquarters. This search consists primarily of pitting various localities against each other to see which will make the most compelling offer to the online retailer. Amazon is leveraging its economic might to wangle enormous tax breaks and infrastructure spending targeted to benefit its workforce from cash-strapped states, counties, and cities. County Executive candidate Elrich has made no secret of his disdain for sweetheart deals and has expressed concerns about various secret aspects of a proposed $5 billion package of incentives to entice Amazon to locate in Montgomery County. Post endorsees Blair and Riemer, by contrast, support the incentives. Blair goes even further, staunchly backing even more aggressive county efforts to land the low-wage multinational behemoth. The Post’s somewhat puzzling decision not to endorse Brandy Brooks may well stem from its owner’s Amazon business interests. At first blush, Brooks, a charismatic African-American Latina with a high-tech background, who has run an extremely smart campaign, would seem like the kind of candidate the socially progressive Post would champion. But to an even greater extent than Elrich, Brooks has called out the kind of sweetheart deals that Amazon is seeking as corporate welfare that harms taxpayers. Perhaps, this is why the one woman the Post backs for County Council-at-Large is not the fiery Brooks but Gaithersburg-Germantown Chamber of Commerce President Marilyn Balcombe. The Washington Post promises to avoid conflict of interest and even the appearance of conflict of interest. It failed to abide by this laudable pledge, however, when it issued endorsements in the upcoming Democratic primaries in Montgomery County. Even worse, it does not even acknowledge how its owner’s financial considerations may contravene the interests of county residents.